I read this list of tips before and I found the first one interesting. Never tell anyone the plot of your story until you've finished writing it. Once you've told your story, even in outline, some part of you relaxes. The story-telling urge is fulfilled. You've seen your audience react to it, and actually writing the story then becomes something of a chore, like you're repeating yourself. It's much better to keep the urge alive, driving you on until you've got the story down on paper, and you can then present it to the world in all its glory. I heard another writer say the same thing today. He was being interviewed and he mentioned to the interviewer that he would have loved to talk about the novel he was working on. He was very excited about it, but if he started talking about it there was something inside of him that would relax and not be as excited about writing it. I guess there is something in the telling. Here's Part 4. It comes to us from March of 2006. Gina and I had been dating for nine months at that point. We've been married nine months right now. That's kind of cool. This piece, however, is not. It's really weird. I've been to the horse track three or four times in my life, but, for some reason, I set this piece there. It doesn't feel finished but I am remembering that I ended it there for a reason. Not sure what that reason was now since it just sort of stops. Looking back, it was advice I never should have taken. Honestly, looking back, it wasn't advice at all. It was a warning. But, at the time, it just seemed like the ramblings of a disturbed man. He grabbed both of my arms in his massive hands and looked at me crazy-eyed and in an almost inaudible whisper said, "Six in six." I stared into his black eyes. "Six in six, " he said again . "Six in six." The third time he shouted it, let go of my arms and ran across the parking lot. The sixth race had a purse that was nearly a quarter of a million dollars, the biggest possible paycheck on a very average day at the track. The sixth horse was named Month of Sundays and a modest long shot at 12-1. This had to be what he meant. Bet it all on Month of Sundays. Heck even the name was religious. If not religious at least it had the word Sunday in it. Not much of a sign but when your luck tank is running as dry as mine was at that time you'll take any coincidence and twist it into some sign that you're getting a little time in Heaven's spotlight. I’d spent my entire morning asking for a sign. Some way to get behind fate's curtain and see all the winners before they raced. This had to be it. Month of Sundays and the crazy man in the parking lot telling me "Six in six." No doubt this was it. "$100 on No. 6 to win." The order of finish was Voltaire, County Line, and Burnt Sienna. Month of Sundays took nearly that long. I mentioned in one of my earlier posts that I struggle with editing myself as I write. Here's a nice quote from Anne Lamott on first drafts. I've never read any of her writing, but this is something I know I need to hear. Other writers might need to hear it too. Not sure if any of them are here reading my ramblings, I assume not. But I will post it just in case. Besides, I can always go back and read it again myself if I save it here. For me and most of the other writers I know, writing is not rapturous. In fact, the only way I can get anything written at all is to write really, really s****y first drafts. The first draft is the child’s draft, where you let it all pour out and then let it romp all over the place, knowing that no one is going to see it and that you can shape it later. You just let this childlike part of you channel whatever voices and visions come through and onto the page. If one of the characters wants to say, “Well, so what, Mr. Poopy Pants?,” you let her. No one is going to see it. If the kid wants to get into really sentimental, weepy, emotional territory, you let him. Just get it all down on paper, because there may be something great in those six crazy pages that you would never have gotten to by more rational, grown-up means. There may be something in the very last line of the very last paragraph on page six that you just love, that is so beautiful or wild that you now know what you’re supposed to be writing about, more or less, or in what direction you might go — but there was no way to get to this without first getting through the first five and a half pages. And if anyone is here other than the folks I already know read this, say "Hi" in the comments. I'd love to know that this little outpost on the web isn't populated by just the three of us. This time we step into the way-back machine and go to January 2003. If I am remembering correctly this is the first exercise I finished. I think I was pretty proud of it. I look at it now and see how the whole thing is overly wordy. I still like the idea of two arguing scientists, one more concerned with rules and regulations. The other is just concerned about the break-throughs. But the writing here is not my best. After posting it to the group it got decent reaction. I think that people liked the use of dialogue to tell the story. It was good motivation to keep going. I have the prompt to go with this one too. PLEASE DOCTOR. THERE MUST BE SOMETHING WRONG WITH ME, OR MY TECHNIQUES. I’VE HAD TO START THREE TIMES, AND EACH TIME SHE/HE/IT FREEZES. And here is what I did with that. “Mass. That was the one factor that was off in all of our calculations. We never could figure out what the breaking point was. We did lose a lot of stuff early on in the process but we thought we had it figured out. We thought we’d cracked it. The only way to figure it out was to send one of the members of the team.” Dr. Henning pulled a folder from a drawer in his desk . “This should cover everything,” Dr. Henning said as he handed the folder to Stevenson. Henning handed Stevenson another folder. Watching TV last night, or better, watching Tivo, I got an idea for another story. It's a little out there and I am a bit worried that it's a bit too much of a copy of what I was watching. But still, I am excited. I have definitely put it onto my ever growing idea file and am wondering if I shouldn't get a little start on it just to see where it goes. I don't know if other writers do this, but I keep using the same name over and over. It's just one name, Paisley. I came up with it once for a character in a story a long time ago. She was actually a criminal. Well, in the story whether or not she was a criminal is up for debate. It all depends on the how the reader interprets what she does. Anyway, I used the name there. Then I used it again in another story. I don't remember which one. Finally, I found the character that the name always belonged to. She's a 12-year-old girl in the future. She's in the story that I am most excited about right now and that makes me happy. It's really not a big deal that Paisley appears in so many of my stories. Most of them are just practice anyway. They are things I wrote while I was searching for my voice as a writer. Those stories didn't do her justice. I am not sure that the story she is in now will either. I just know that the name finally has a character that fits it. Here is another flash fiction exercise. I am picking these at random, not in any order. This one comes from January of 2006. I mentioned that I'd post the prompt when I had it. This is one of those cases. This is what I had attached to the top of the file. I started receiving prompts from this group in 2003. I stuck with it for awhile but eventually stopped doing them. Then in late 2005 or early 2006 I rejoined the group and started writing again. Obviously this is the second time. I don't have any idea where the story came from, especially the lady laying on the bed in lingerie. That's definitely like my writing. I am sure that I fretted over including it. I probably fretted then went with the story as it came to me in my head. Anyway, here it is. He held the red dress by the waist and stared at the woman in the bed. This was it. This is what he wanted. The life that everyone said was normal, but he knew it wasn’t something he could have. Not with her anyway. They had a working relationship. Heck, he didn’t even know her real name. He called her Paisley and the last three days with her had been perfect. She’d collapsed on the bed in her half slip and bra after their second Christmas cocktail party in as many days. The cost of doing business. Going to take the new neighbors for thousands of bucks you have to get a look around inside their houses some how. It wasn’t the best life, he knew it, but most of the time he didn’t care. Most of his conscience had fallen away years ago. But occasionally he’d get these feelings looking at Paisley. He wondered how he’d handle a normal life. A life that started early in the morning and included work and kids and dinner when he got home. He told himself he didn’t need it. Just something to ponder when he felt like feeling down. When he met her a month ago she’d been charming and could have popped corn she looked so good. Getting to play house with her the last few weeks had been fun, almost normal. It gave him, just for a moment, hope that he could be this thing that he wanted to be. For these last five days he‘d been Joe McAvoy, a computer engineer that moved to the neighborhood because it looked like the perfect place to raise kids. It was, he was told. The schools were good, there was a park just down the street and everyone looked after everyone else. He and JoAnn were excited to be part of it, he told people. When he had come in this afternoon to get ready for the party the scent of her perfume was still in the air. He paused for a moment to enjoy it. Then saw her in the dress and was shell shocked. At the party he watched her work the room, bouncing as she walked, and realized that as much fun as he was having playing house it was all going to be over soon, because here she was on the bed in her slip and bra and three wallets next to her. She had picked them during the party. Just for fun, to keep from getting rusty. When I was in seventh grade this is the house I dreamt of. Several years ago I joined a Yahoo group that would send daily flash fiction prompts to its members. It was supposed to be a motivator for me, something to get my writing juices flowing every day. The plan was for me to bang out something that fit the prompt then turn my attention to my own stuff that I was working on. Sadly, I didn't do that. Many times the prompts didn't inspire me. Other times I just couldn't finish what I started. The pieces from the prompts would peter out two or three paragraphs in. Looking through my stored files last night I realized that I had kept several of these pieces. Some are finished. Some aren't. But since they are just going to gather more dust sitting on my computer I figured I'd post a couple of them here. I don't think any of them are longer than 1,000 words, but I could be wrong. I still have some of the unfinished pieces. Those are definitely shorter than 1,000 words. I'll post those too. It looks like this one comes from June 2004. This one, I don't think, is complete. It's only a page long and doesn't really have an ending. It's been so long that I have no idea where the inspiration for these came from. Something in the prompt just sparked something in me I guess. I have the prompts save for a few of them, but not all. If I do I'll post the prompt it at the beginning. I don't have it for this first one. To be honest, I'm a little nervous putting this stuff out there. I haven't had my writing in a public setting like this. I have to start some time, right? No more stalling. Here is the first one of these. I'd love to know what people think. Summers sat at the end of the bar swirling bourbon in a dirty glass. He traced a gouge in the wood with his finger and listened to the conversation behind him. Summers shook his head, downed his drink and slid the glass down the bar. They didn’t know from unfair. It was just a form letter but that didn’t make it any easier to read. It came in a white envelope with the letters CB in block print in the upper right corner. The Corrections Bureau. That’s what they called it. Officially it was redirection, a government sponsored move to the life that they say you were meant to have. Math. It was going to do it to him again. It almost got him held back in the second grade and it kept him from the dean’s list more than once in college. But now math was going too far. Now math was going to force him to move from his home, sell his cars, change his entire life. An old friend of mine contacted me a few months ago about contributing to a fantasy baseball site that he was helping to start. It's called Baseball Instinct and there is a link to it on the right. Or you can just click here to go to the home page. He just posted my second piece to the site. I am having fun coming up with stuff to write there. I don't have the fantasy experience that the other contributors have so the stuff I am writing isn't as analytical, but I think that's OK. You need some lighter stuff. My first piece was on the Royals. You can find it here. I know it's not a paying market and it's not fiction, but I like that my words are out there somewhere other than here. There is an interesting take on self-publishing over here. I may have more on this later but wanted to get the link posted before I forgot. And I will say, briefly, that I agree with the general point made over there on Futurismic. Economic forces are going to be the thing that make self-publishing a more viable and accepted from of getting your work out there. Just like we are seeing the journalism world change because of economic and technological forces, publishing is going to go through a similar transformation. The biggest change for the reader will be sniffing out what is quality and what's not. All of our gatekeepers are becoming unnecessary. How do other writers deal with having three or four ideas going at one time? I have three stories that I want to write at the moment. There is the big project, the one about Paisley and the pirates. Then there is another that I started long ago but stopped because I couldn't figure out how to make one leap. I had to get the main characters from one place to another. I didn't know where that other place was until recently. Now that I have figured it out, I am itching to write on that one. Then, there is a third piece that I started a few weeks ago. It's something new for me and I am excited by it. It's a more straight science fiction piece, something I have never, ever tried. I have read a bit and the Paisley piece is set in space. It's not really sci-fi though. It's just set in space. The story could take place anywhere. I don't know how other writers deal with this itch to write multiple things at once. I want to keep pushing forward with the Paisley piece since it's something I have been thinking about for a while. But I don't want to lose the ideas I have on the other two. They are still front of mind and I'd hate to lose any momentum I may have on them. I wrote a bit more last night. Hoping I can do some more today at lunch. Still not sure there is any steam behind my story but I'm glad to be making progress. Any movement forward is progress and that's what the point is. In sixth grade I built an air-powered car for my science fair project. I used a hammer and nail to puncture an air-gun cartridge that I had connected to a car I made from some building blocks. I used it to show how jet propulsion worked. It was pretty cool, if I do say so myself. These Spanish students put me to shame. 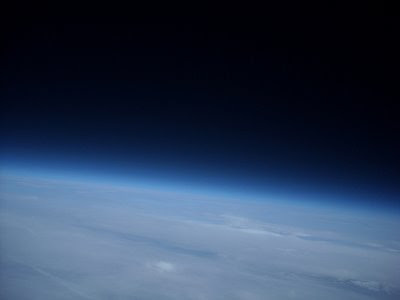 They constructed a balloon that went to the edge of space. It took atmospheric readings and sent back pictures. 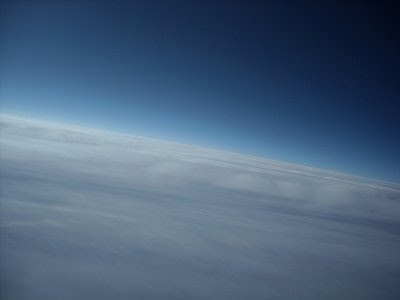 From the edge of space. These are Spanish high school students. There is a story here. And a set of Flickr pictures are here, but here is a sample. When I started this blog, all 8 posts ago, I figured it would be mostly about writing. Just a way to keep myself motivated to do it and not be frustrated by it. Well, I haven't done so well. Not as well as I would have liked, anyway. So from now on that's I promise to be better. A more regular poster and a more motivated writer. I started last night. I wrote about 500 words on the Paisley pirates story. I am enjoying it so far but feel the steam running out. I have the plot loosely outlined. I know what is supposed to happen. I know who the heroes are. I know the villains. And I know how it ends. What I don't know are the specifics. I think that's where the steam is escaping, through the holes I have left in my plot. What's missing right now is a little conflict. The plot is moving ahead, but I know if I am getting bored with the tale at this point the reader would be too. I am very tempted to go back and edit what I have done so far. I am about 12,000 words in and this is always the point that my editor's pen starts to shake and want to come out of its pocket. I am trying to fight the urge and to just keep chugging on with the first draft. I am excited about this piece. I don't want to call it a book yet. I am sure it will get there as slow as the plot seems to be moving. Still, after the editing it could wind up a short story. Anyway, new focus. That's what I've got right now. Going to post more regularly. Going to write more regularly. And hopefully I won't bore you if the updates are just this kind of thing. I'll try not to let them be, but for now that may be all I can muster. We got back from Las Vegas earlier this week. That's why neither my wife or I have posted on our blogs in almost a week. Not that I think there are that many people out there reading this. My wife and I went with my family and had a great time. Well, except for the part where she got sick. But I married a trooper. Not one time did she let the fact that she was feeling completely lousy get in the way of our having fun. A cough. A fever. Congestion. Gee had it all and was taking medicine every four hours to try and kick that thing. Still, she got up out of bed, even though it was the last thing she wanted to do, and powered through some long days as we went from hotel to hotel looking at all of the attractions. She even managed to win a nice little chunk of change at really fun slot machine. We had budgeted a certain amount of money that we were OK with losing and we both were well short of losing that much, so even though we didn't come home winners were aren't as poor as we expected to be. In my book that's a successful trip. I'd rather be in the car right now driving east to see my wife and have a quick lunch with her, but I can't. Things at work this week have us running behind and I have to stay here and eat lunch instead of getting out from behind this desk and going to see her. I hope she knows that sitting in a little blue seat in here classroom sharing a Subway with her is where I'd rather be instead of lunching at my desk. Well, I did write some today. Banged out about 75 words this morning. I am a miserable failure. Horrible and miserable failure. But I am not a quitter, so I'll try again tonight before bed to finish my 100 words and see if I can't complete the first night. Just wanted to give an update. Accountability , you know. We had a retreat at work today to talk about what we should be doing on the Web that we aren't doing now. Our day started with a presentation by one of the Internet gurus at work. It was really interesting and I don't know that I can tell you exactly why. I always like things that like that, presentations that look forward. I love possibilities. I get excited by them and I want to figure out how to get those possibilities to become realities much sooner than they probably should be. Lots of info on the future of the web and how people are starting to use the Internet. It is amazing to think how necessary being online has become to our day-to-day lives. It's even more amazing to think how much more necessary it will become in the future. Things a re being done now to mash-up technologies so the Internet can be prepared to answer our questions before we even know we should be asking them. 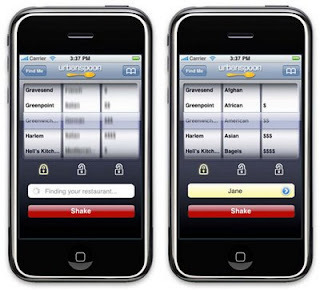 Our presenter kept using the example of Urban Spoon, the iPhone application. Using the locator chip your iPhone always knows where you are. That means that the Urban Spoon application always knows where you are and is ready to recommend restaurants to you at all times, even if you weren't aware 15 minutes ago that you needed to figure that out. See, ready to answer questions you didn't even know you had. There is an application that does the same thing with movie theater and times. Even will let you buy tickets on your phone. Pretty amazing stuff and definitely made me want an iPhone for the first time ever. I won't get one because they are on the wrong carrier and I can't justify the cost just so I can find restaurants and movies. But it was very cool to see what the future of the web was. Another thing I got out of today was how unsophisticated I am when it comes to using the web. I still go t blogs that I like everyday instead of using an RSS feed or bloglines.com. I still visit other sites to see if there is new content. Today really drove home that I need to be more advanced in my use of the Web. I need to be harnessing it to its fullest. And I plan to do that, once I make sure it hasn't killed my job. In my first post I said that I worked here. Obviously I have a vested interest in the news industry, if for no other reason than my new wife and I have gotten used to having a little more disposable income now that we are married. I found this article by David Carr at The New York Times very interesting, especially his last point. It’s worth remembering that the regulatory apparatus governing the industry was developed back when newspapers were the dominant local ad medium, with very little competition. In recent years, the Newspaper Preservation Act has done precisely the opposite of its framers’ intention, allowing joint operating agreements that let weak papers linger and pull down the alpha papers in Detroit, Seattle, Denver and Tucson. The Justice Department still holds that combining local dailies is anticompetitive, but if that antiquated logic continues to prevail, there won’t be much left to regulate. How much have I written total? Last night, after writing my last post, I started wondering how much I had written since I started writing somewhat regularly 10 or so years ago. I am not under the delusion that it will be a huge number. I don't expect it to be some tiny amount either. If I am able to finish reading all that I have for work at a decent hour tonight I will try and add up all the things that I have stored on my hard drive. I know I have three pieces that are about 50k words each. Then there are a lot of other smaller things in there. Some starts of short stories and some flash fiction. Hopefully I'll have a better number for you later tonight. My bride and I were at church a couple weeks ago and listened to a guest speaker give a sermon that struck us both as eye-opening. It was on next steps. Sort of where do you go next. I won't try to relay exactly what he said, but the main point was that God is not concerned with our missteps but with our next steps. He is more concerned with where we go now. We both left and said to each other that it was really a great sermon and one that we each needed to hear. We each have a tendency to beat ourselves up over our mistakes, especially when it comes to food. She does it more than I do, but we are both guilty. So, here's a confession. I haven't written a word since my first post. Not a single word. I should be 300 words into my 100 words a day challenge. Sad. I couldn't even do it the first night. I do have some excuses. I have a lot of reading I need to do before a Tuesday meeting at work. That has taken up most of my down time. Plus we have had things to do around the house. With my hours and my wife's long work days our evenings aren't the best time for us to cross things off our to-do list. That leaves the weekend as the days when we can do all it is we need to do. But really, these are all excuses. I should be able to scratch out enough time to write 100 words a day. I can't let me beat myself up. I need to be concerned with next steps and not my missteps. So, tomorrow it's 100 words at least. Even if it means I find the time late at night to do it. In my head, I was just going to start posting. Dive in without saying who I am or what my plans for this blog were. That's mainly because I don't think I had actual plans for it. Then I thought about it and decided that this would be motivation -- a reason to write everyday. I find that it's hard for me to find the motivation to sit behind a keyboard at night after I've just spent my entire day dealing with words. I work here. I help do this. So when I get home after reading A LOT from 9 a.m. to 7 p.m. I don't have the motivation to pull out the laptop and deal with words some more. And lots of nights I go to bed regretting my laziness when it comes to writing. There are two things that I have wanted to do ever since I was a little kid, elementary school age. I wanted to write stories and I wanted to work at a newspaper. I have done the latter and I think it may getting in the way of the former. No, I know it is. It's a poor excuse, but my days at work are long, and, despite what some think of what I do, at the end of them I am mentally tired. My head stops thinking and all I want to do is sit in front of a TV with my wife and let my brain relax. But I can't, or better yet, know I shouldn't. If I want to ever publish any of these stories I've half written I can't let myself watch another night slip away. This is my goal. One hundred words a day. I read something a couple of years ago that said if you have writer's block you should try to write at least 100 words a day. It seems like a small amount, but at the end of a year if you are faithful you will have 36,500 words. That's nothing to sneeze at. And besides, once the words start flowing you aren't going to stop at 100 words. Two other topics you will probably see a lot of here. Food/weight loss and baseball. I am a newlywed and my wife and I are both trying to lose a little weight. We got a little comfortable the first few months of our marriage and got a little lazy with our eating. We are getting it back under control and it's a big topic of conversation at our house, so it's bound to leak onto the blog. It's already leaked onto hers and it's just a week old. And when I said earlier that there were two things I wanted to be when I grew up, that wasn't exactly honest. I also wanted to be the third baseman for the Kansas City Royals. I have been a baseball fan since I was a kid and with the season starting in mere weeks there will be some baseball talk here as well. That's on top of the pieces I contribute here. That's it, my overly long introduction. Hopefully if you read this you'll come back and read some more. I promise they will be more interesting in the future now that the introductions are out of the way. Until then.